The MEAD gives the Haute-Combe area a pedagogical vocation by working on food issues: visits of children (schoolchildren), grown-up (elected officials, communities technicians, territorial agents), establishment of cooking workshops and nutrition, discovery of applied agronomy, educational garden, jumping classes... The Center For Sustainable Food Education opens to all audiences : parents, social grocery beneficiaries, seniors, economic actors (restaurants, hotels, food outlets, businesses, food trades). In 2017, the first "Positive diet families" challenge has been created to support families in changing their eating habits without increasing their budget. Children discover organic farming at Haute-Combe. 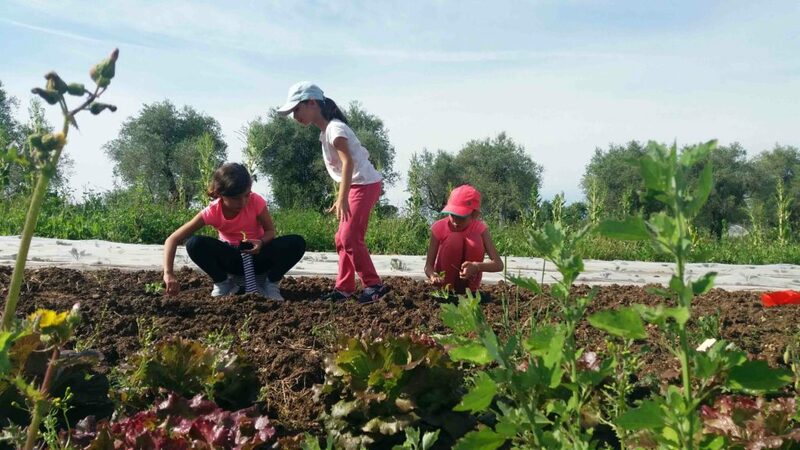 Thank to TAP (extra-curricular activities), in connection with the city media library, children often brought visit the municipal farm. On the one hand to become aware of foods origin but also to get their hands dirty; a good way to understand the mode of organic farming. Cooking and nutrition workshops are planned. During the day from 3:30 pm, a chef and an entertainer welcome a group of volunteer children in a culinary area to prepare a dish, most often vegetable-based. Finding out raw vegetables and the way to cook. In addition, some educational gardens are located in each school. The animators have at first imagined the development of vegetable gardens, but it is not easy to put in place since the vegetables mostly grow ... in summer. Instead, plantations of aromatic plants emerge. The pedagogical support remains the same: discovery of seeds, plant cycles, insect pests, useful little beasts, ways to manage with organic solutions any specific inconvenience. This approach combines with regular visits to the municipal farm, where the children are fortunate enough to see how it works and what's going on.